Aware LoRa Hub Spans an Impressive 28 Floors! On March 27th, after the install of our in-wall humidity leak detection solution – consisting of (4) sensors deployed between the 30th and 34th floors, and a LoRa hub – our customer, and the Resident Manager of the building, reported that he'd temporarily uninstalled the hub. Despite this, we were still receiving data from 2 of the 4 deployed sensors. This wasn't much of a surprise to us, as we equip our hub with GSM technology as a fallback mechanism when a customer's WiFi is down, or unreachable. So when he plugged the hub in on the 2nd floor, it switched to GSM mode, and continued to collect and send data. One of the sensors it was picking up data from was located in his office, with the hub. 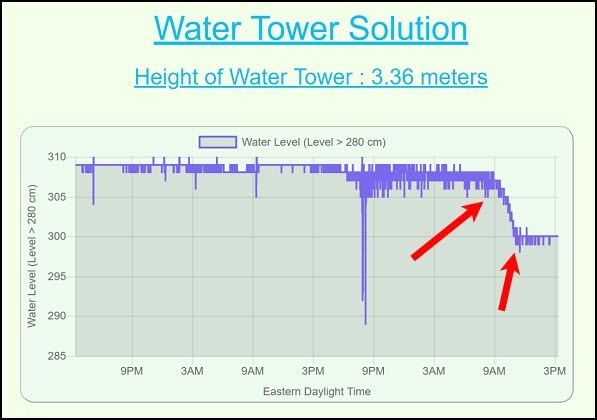 The other sensor our LoRa hub was detecting was a whopping 28 floors away, on the 30th floor! We do not expect communication between anything more than 3-6 floors away, so to learn that our sensor was capable of transmitting over such a range was an amazing discovery! We still do not plan on building our solutions around these findings and will continue to deploy hubs based on our 3-6 floors per gateway estimation, considering every building varies, but this was good to learn! 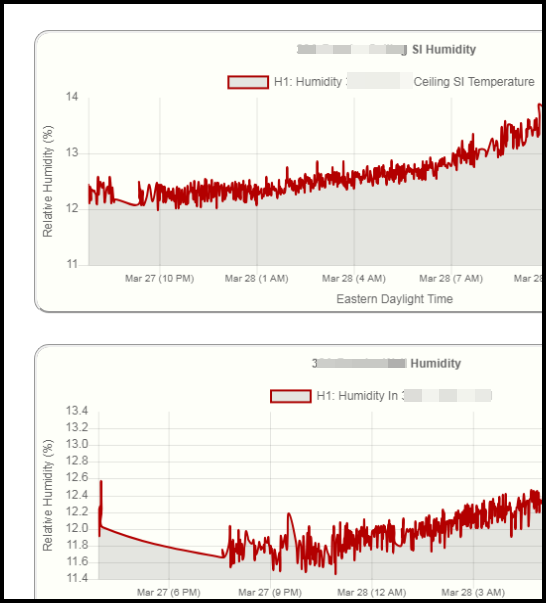 See below for the relative humidity data for the 2nd floor sensor in his office, and the 30th floor sensor in the wall. What's on our Roadmap for 2019? We’re listening. 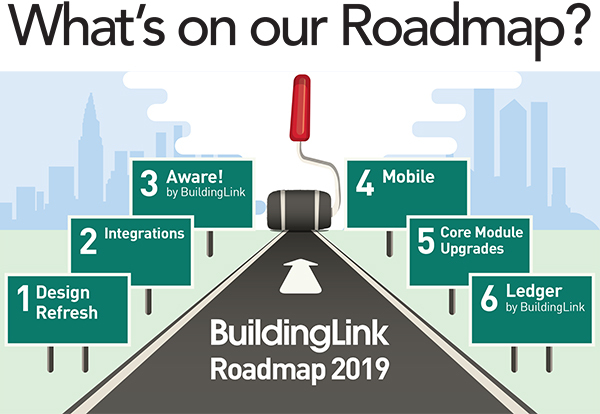 Over the course of 2018, we’ve heard from thousands of BuildingLink users. Maybe you offered some feedback to our sales team at a trade show, or called in to our technical support line, or emailed us a “customer comment”. You’ve told us which features you can’t live without, what modules are most important to your property, and where we can do even better. We understand that modern residential communities are increasingly dependent on best of breed technology, and it’s more important than ever for those who work or live in them to have a software solution that is powerful, evolving, integrated, and flexible. With that in mind, we have set our 2019 development priorities! We are proud to share with you our 2019 Roadmap of new features and enhancements that our team of more than 60 software developers will be working on this year. Easy navigation, quick customization, and branding finesse makes all the difference. Management Site – An improved management site will give priority to administrative convenience, a fresh look, and actionable analytics. Look for a simplified software learning process for training new staff, and streamlined workflows for your more experienced team members. Email Templates – We’re enhancing our automatic notification emails with a new design, and giving you the option to add your touch of branding to them. We’ve also been adding features to our core Send Email module, and in 2019 we’ll continue this development by including options like customizable sender signature footers, automation rules, and a Resident Daily Digest email option. Public Displays – One of our most frequent requests over the last few years, we’ll soon be launching a revamp of our Public Display module. Whether you’re displaying delivery information, your building calendar, or local transit schedules, expect sleek and modern aesthetics, greater flexibility, and more content options. Feel like you’re being pulled in different directions? Let us be your anchor. We are taking some bold steps in 2019 to help end your nightmare of too many, separate solutions. You’ve got one site for rent, two others for maintenance, an accounting app your nephew invented, a camera system that only works during Daylight Savings Time, and none of which work together! It’s time to let BuildingLink be the hub of your technology universe. Property Management Software Integration – We already integrate with many of the most popular property management and accounting software programs, but will continue to incorporate more throughout the year, including the ability to view, sync and manage maintenance requests and display residents’ account information. And if you're in the market for a new accounting solution, keep reading to learn about our own entry into this race! Access Control – New integrations with Brivo, Carson, and SMARTair will provide easy control of resident access to common areas, as well as smartphone “key” options. Online Proxy and Voting – Getting a quorum or voting in board elections can be tough when many unit owners live offsite, or are out of town. Make sure every voice is heard with the our upcoming online proxy collection and voting features, accompanied by an enhanced multi-question survey module. Package Lockers – For properties using an automated package locker solution, expect new integration options to give your residents a simpler, more accurate experience. Faster Online Rent Payments – Implementing our “single sign-on” feature will give residents even faster, authorized access to their rent payment portal pages. Voice-Activated Assistants – Later this year, Google Home users will receive the same voice-command capabilities that we currently offer to Amazon Echo/Alexa users. Questions about repair requests, packages waiting for pickup, staff directory, and building events are all just an “Okay Google” away. And keep your ear to the ground for even more capabilities with Amazon Alexa! We’re developing an array of sensible sensor solutions that won’t break the bank. See www.buildinglink.com/aware for more details. Leak Detection and Shut Off – A burst pipe can cause hundreds of thousands of dollars worth of damage in minutes (especially overnight! ), so we’ve created a Flow Detection and Burst Pipe solution that shuts off your valves automatically when an unusual water surge is perceived, effectively mitigating extensive water damage. Our related Leak Detection solution includes options to detect water presence, water level changes, overflow, and unusual in-wall or in-cabinet humidity spikes for rapid detection and response time. Parking Sensors – The Aware Parking solution tackles guest parking management via our IoT enabled sensors that monitor real-time occupancy of indoor and outdoor guest parking spaces. In addition to real time availability info, we’ll also provide management analytics to identify peak demand, average stay, and other usage patterns. HVAC – With Aware, out of sight does not mean out of mind! Our Environmental Monitoring and Rooftop Mechanical solutions help fine-tune your systems for maximum, even comfort across all your common areas, and will alert you when rooftop equipment anomalies or malfunctions are detected. Smart Home – Internet-enabled devices are more popular than ever, but can present a real "duality"challenge for multifamily properties. Residents need quick onboarding and access to their unit's devices only, while managers need the ability to control, install and decommission all devices across all units. Later this year, we’ll begin working with beta-tester clients to provide this "duality": a Smart Home dashboard for property managers, as well as resident control within our BuildingLink Resident App. People Counting – Our Computer Vision aka “People Counting” solution will give you utilization and traffic counts of individuals and objects present in or passing through a localized area, and provides traffic pattern information. Because your staff and your residents live life on the go! Resident In-App Messaging – Need to touch base quickly with your front desk or maintenance personnel? We’re excited to announce new chat features for 2019, with options for residents and staff to communicate directly in real time. Enhanced Resident Services – Soon to appear in our resident app: a curated selection of useful vendors and services. Give your residents added value with in-app access to on-demand dry cleaning, shoe repair, handyman services, and more – available only to BuildingLink users and carefully vetted by us. GEO Communication Tools – Because your building emergencies can happen at any time, our GEO app will be enhanced to allow management to easily send group emails and emergency phone and SMS broadcasts to residents from their mobile device. Parking Vehicle Management – Coming soon: building personnel can monitor parking areas with their smartphone by using our GEO app to verify parking permits, check vehicle information, and crack down on unauthorized parking. Maintenance, Inspections, and Checklists – Some tasks involve more steps than can be captured in a single work request. Soon, you'll be able to create multi-step work orders and workflows for defining unit inspection checkpoints, organizing a list of daily tasks, and coordinating more complex projects among multiple staff members. You’ll also see enhancements like the ability to schedule work, collect resident satisfaction feedback, and more. Amenity Reservations – We’ll be simplifying the Reservations module to feature a more user-friendly “time-slot” based structure, giving you more flexibility. Extra tracking fields will be added for recording the number of expected guests, setup requirements, and more. And we’ll be making the entire process more automated and seamless, including integrated payments. Recurring Visitor Management – Our Quick Visitor Check-In feature will be released soon, and throughout the year we’ll be working on more solutions to speed up the process of securely admitting frequent visitors and contractors. Because you wish every program were as easy as BuildingLink! Our newest technology initiative, Ledger by BuildingLink™ is a full-fledged property management and accounting program that seamlessly integrates with BuildingLink. It features paperless documents, tenant/lease management, legal tracking, violation tracking, drill-down financials, board reporting, invoice approval workflow, and alerts for court dates and expiring leases. It is currently in use by a number of beta users and is receiving great reviews! Best of all, Ledger by BuildingLink is easy to learn and provides a clear, intuitive interface. It’s great for condos, co-ops, and rentals. Book a demo now!